Vortex Optics Viper PST (Precision Shooting Tactical) Scopes are designed with tactical and precision shooting in mind. The Viper PST optics come with all the features associated with top-tier riflescopes, but at a more affordable price point. 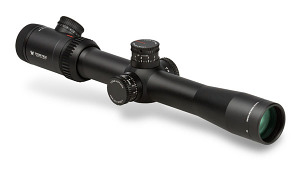 The Viper PST 2.5-10X32mm is a first focal plane scope that features crisp, clear glass for increased resolution, multi-coated lenses for increased light transmission, ArmorTek coated lenses for scratch and debris protection, Argon gas purging with O-ring seals for superior fogproof and waterproof performance, illuminated glass-etched ranging reticle, and hard anodized finish. Lifetime Transferable Warranty!